Just mix with boiling water, stir, and it's ready to eat. This cooks the fastest of the rolled oat varieties. This organic dried maple syrup adds great flavor to these instant oatmeal packets. Click below for more natural sweeteners. These are 100% organic blueberries. They rehydrate instantly in the oatmeal when it's mixed with water. 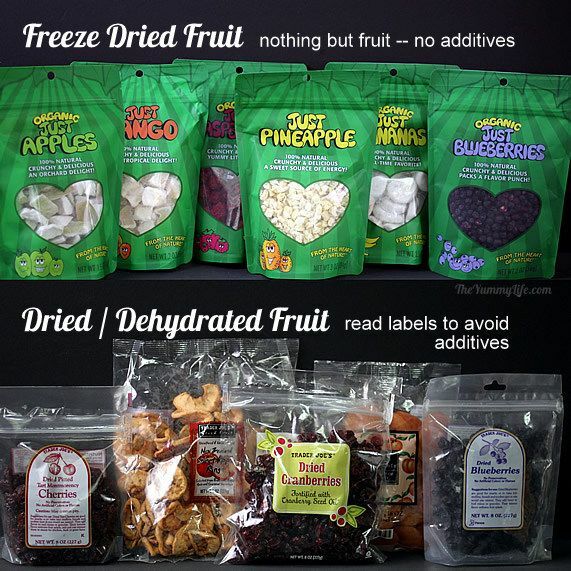 Click below for more freeze-dried fruits. Get all of the flavor and protein of peanut butter with 85% less fat. It's a dry powder that's perfect for flavoring these dry instant oatmeal packets. This adds a protein and calcium boost to the oatmeal along with a creamy texture and flavor. 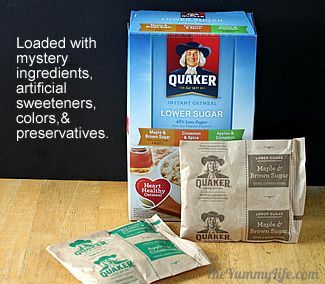 This is 100% ground vanilla beans and is a great way to add vanilla flavor to a dry mix like these oatmeal packets. 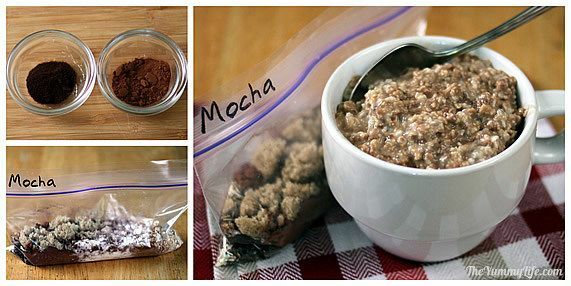 This adds easy, rich flavor to the Mocha Instant Oatmeal Packet. An easy way to add orange flavor to dry mixes. It pairs well with many other fruits, especially berries. 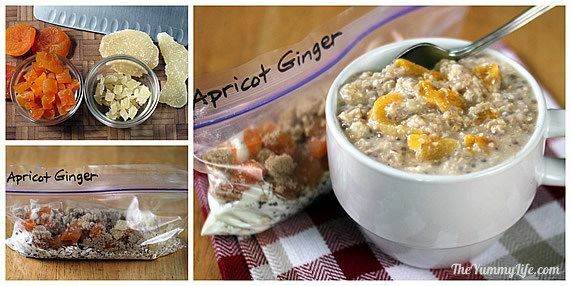 This candied ginger adds great flavor when it's minced and added to the Apricot Ginger Oatmeal Packet. These are the perfect serving size for storing single servings of refrigerator oatmeal in the fridge. This organic, unsweetened, shredded coconut is a great addition to oatmeal packets; especially good paired with pineapple. 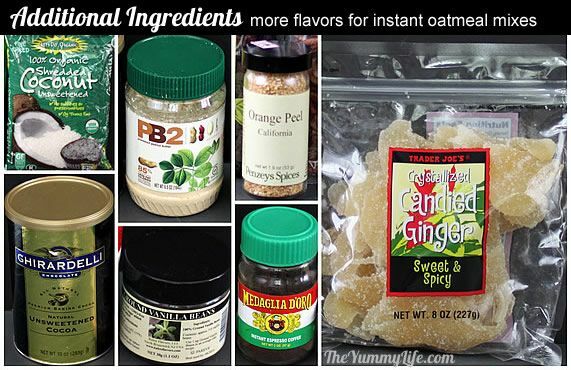 Make your own individual instant oatmeal packets in a variety of flavors. 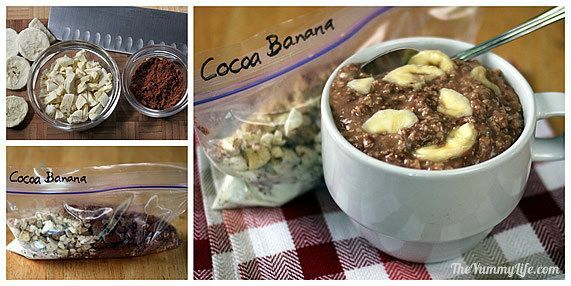 An easy, make-ahead, healthy on-the-go breakfast or snack for work, travel, camping, and college dorms, or those busy mornings when there's no time to make breakfast. 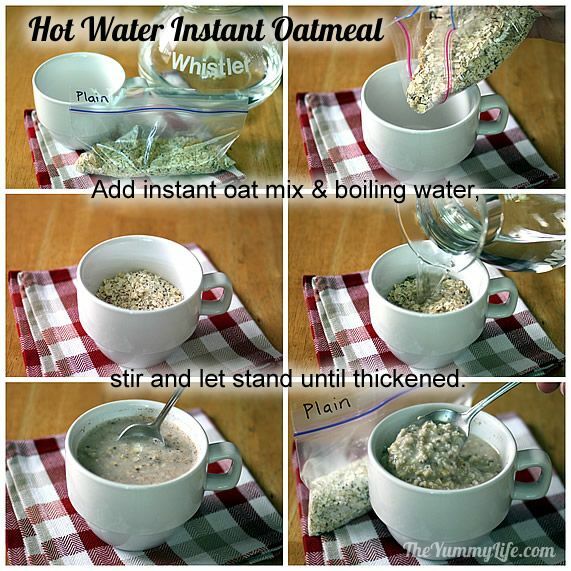 Use packets for hot or refrigerator oatmeal. 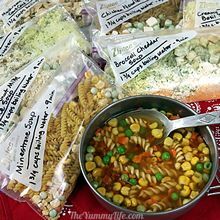 Combine basic recipe ingredients in individual zip top bags. Add additional flavor ingredients, if desired--see suggestions below. BOILING WATER METHOD (not recommended for old fashioned oats): Add 1 oatmeal packet to mug or bowl. Pour in 2/3 cups boiling water and stir. Let instant oats stand for 3-4 minutes to soften and thicken; stir, and they are ready to eat. Quick oats may need to soften an additional minute or two. MICROWAVE METHOD: Add 1 oatmeal packet and 3/4 cup cold water to microwave safe mug or bowl. (The container needs to be large enough to allow for mixture to expand while it cooks. It can bubble up and double in size in the microwave.) For instant oats, cook uncovered on high for 1 minute; stir, and it's ready to eat. For quick oats, cook on high for 2 minutes, let stand 2 minutes, stir, and it's ready to heat. NOTE: Microwave power and cooking times can vary; adjust cooking time if necessary. 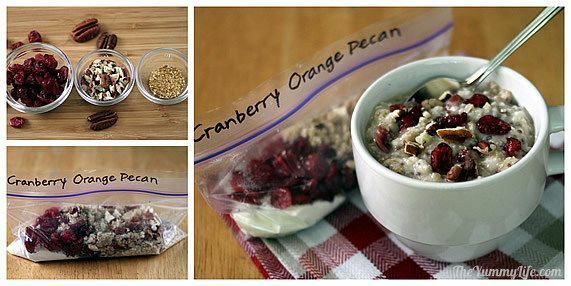 Add one oatmeal packet to a pint or half-pint jar (or other covered container). Pour in 1/2 cup cold water, add 1/4 cup yogurt, cover tightly, and shake vigorously until well mixed. Refrigerate at least 4 hours, overnight, or up to 3 days. 4. Cherry Almond -- 2 tablespoons dried or 1/4 tablespoons freeze-dried cherries; 1 tablespoon sliced or slivered almonds. 5. Apricot Ginger -- 2 tablespoons chopped dried apricots; 1 teaspoon minced crystallized ginger. 6. Cranberry Orange Pecan -- 2 tablespoons dried cranberries, 1 teaspoon dried orange peel bits, 1 tablespoon chopped pecans. Make-ahead convenience. These bags may be made, tightly sealed, and stored for several months, depending on the shelf life of the ingredients used. May be stored in freezer to extend their life further. Nutritional data for the basic oatmeal packets (without fruit or nuts). There is 1-1/2 teaspoons of brown sugar for the sweetener in these calculations. For one plain oatmeal packet: 160 calories, 2.8g fat, 53mg sodium, 28.6g carbs, 3.9g fiber, 7.6g sugars, 6.5g protein. Weight Watchers PointsPlus: 4. 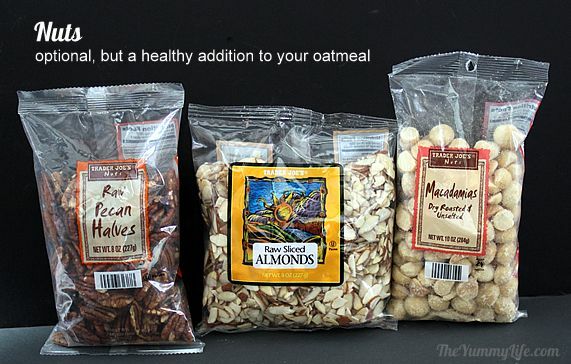 These DIY instant oatmeal packets are so easy to assemble. Make a bunch in advance to keep on hand for those busy mornings when you don't have time to make breakfast. 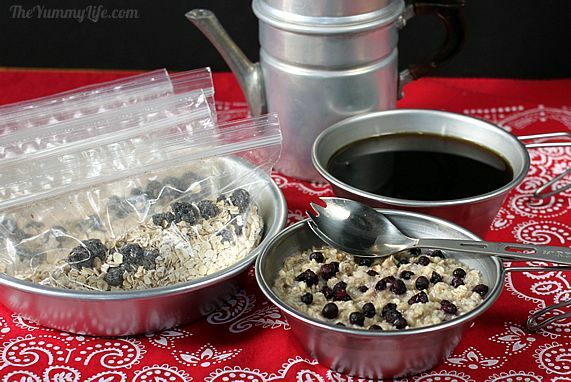 You can mix these oatmeal packets with hot water and enjoy a healthy hot breakfast in a jiffy. They're also great to take along to work or on trips. It's easy to make these gluten-free, dairy-free, and vegan. Refrigerator oatmeal, too! If you're a fan of the oh-so-popular refrigerator oatmeal explained in my post, Overnight, No-Cook Refrigerator Oatmeal, you can also use these pre-assembled packets to quickly mix a batch of fridge oats the night before. 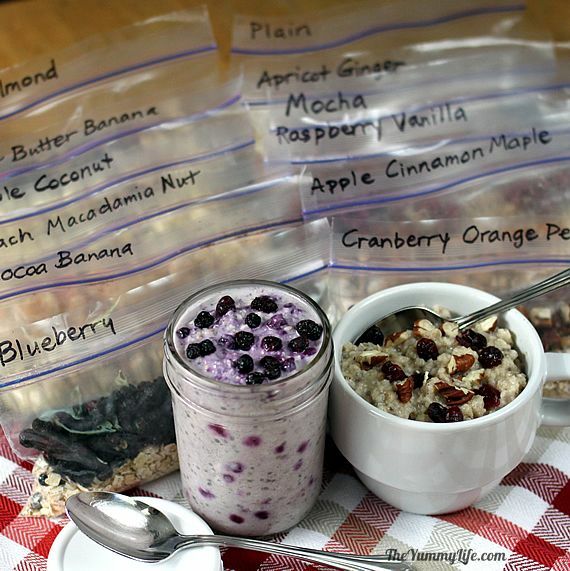 Simply combine a packet with yogurt and water, refrigerate overnight, and creamy cold oats are ready the next morning. 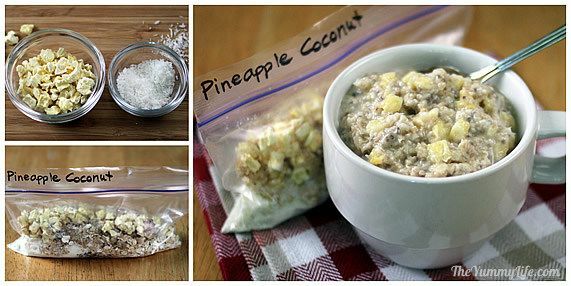 Many are already enjoying the convenience of making refrigerator oatmeal a few days ahead for quick grab-and-go breakfasts. These pre-assembled packets take that convenience to a whole new level. 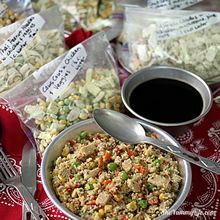 You can make up a bunch of the packets weeks or months ahead to make it even easier to quickly throw together a few batches of fridge oats whenever you like. Why make your own packets? Because they are so much healthier and tastier! I decided to experiment with making my own instant oat packets when I was helping King-Man prepare for a backpacking trip. 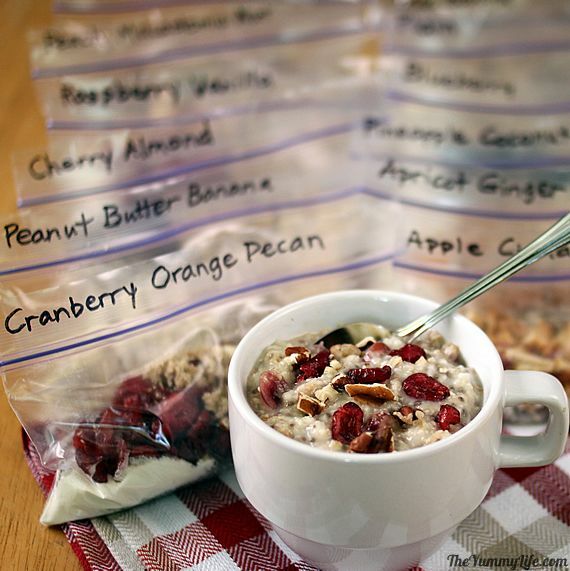 He's always taken the store-bought instant oat packets for an easy breakfast on the trail. When I read the ingredient list on the packaging with all it's mystery ingredients, high sodium, and artificial flavors, sweeteners, and preservatives, I decided to figure out how to make a healthier version at home. Turns out that it's easy to make your own oatmeal packets. They can be plain, unflavored oatmeal, or you can add an endless variety of fruits, nuts, and other fun flavors. I'll share 12 of my favorite combos. Every ingredient is dry and has a shelf life of at least a few months, so these packets can be made well in advance. non-fat powdered milk -- adds protein & calcium along with creaminess to the texture and taste. In case you're wondering if it's better to use fresh whole milk....well, yes. But these are DRY instant oatmeal packets, so fresh milk isn't an option. The health concerns about oxidized cholesterol in powdered milk aren't an issue if you use the non-fat kind. source. If you prefer, you can omit the powdered milk altogether. Here's a quick video that demonstrates how easy it is to assemble all 12 varieties of instant oatmeal in mason jars. 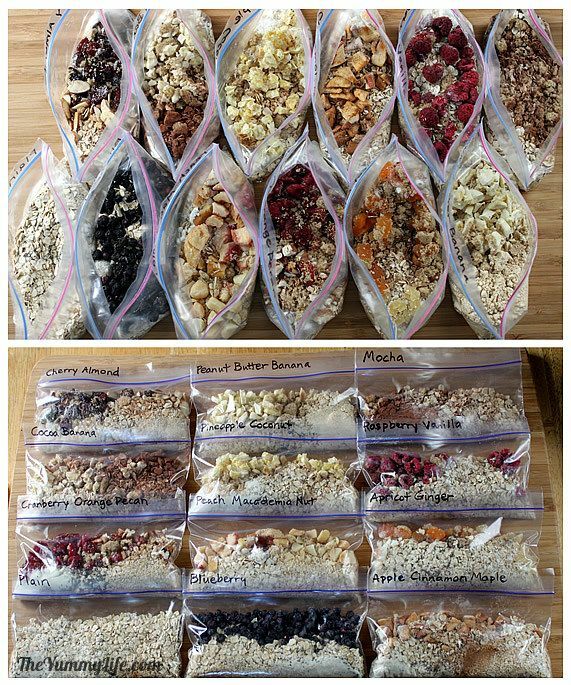 Below, is a more detailed photo tutorial that shows these oatmeal varieties assembled in plastic bags for taking them on-the-go. 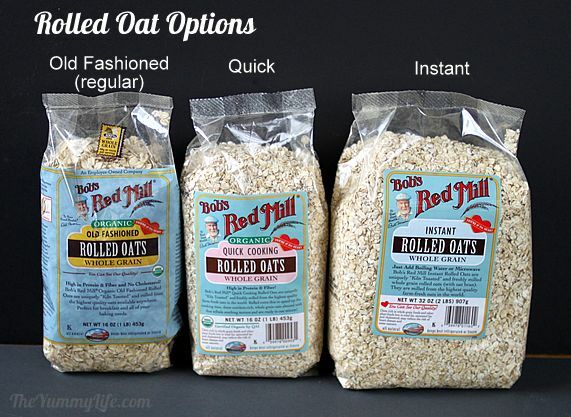 Choose from 3 kinds of rolled oats. They are all surprisingly similar in nutrients. (You can read all about the relative nutrition of different oat varieties in my Ultimate Guide to Oats.) The quick and instant oats are digested more quickly, so they don't do quite as good a job as the old fashioned oats at keeping you feeling full and stabilizing blood sugars. However, my healthy ingredient additions to the mix more than compensate, making use of quick and instant oats very healthy. Quick and instant oats are normally preferred in these oatmeal packets, because they are ready to eat simply by adding boiling water to them. 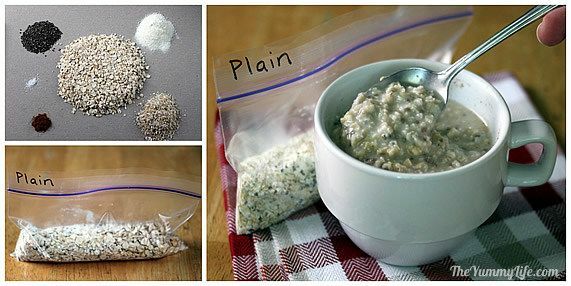 Old fashioned oats, on the other hand, need to be cooked in the microwave or on the stove top; so the choice is yours as to just how "instant" you want your oatmeal packets to be. 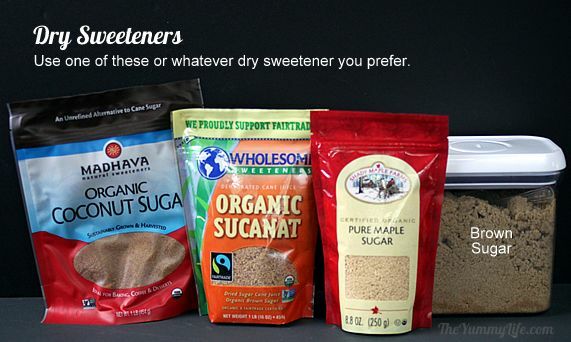 Choose your preferred dry sweetener. Below are a few options that I think taste especially good in oatmeal: coconut sugar, sucanat (dried sugar cane juice), pure maple sugar (dried maple syrup), or brown sugar. I won't get into the nutritional benefits of one over the other, as that's a debate that could go on for pages. My bottom line advice is to use a moderate amount of whatever sweetener you like, or omit the sweetener altogether. How much is enough is a matter of personal preference. King-Man (aka Mr. Sweet Tooth) likes a full tablespoon of brown sugar--that is so sweet that it makes me want to gag and tastes about as sweet as the store-bought packets. I like around 1 teaspoon of sweetener in my oatmeal. Maple sugar is my personal favorite. Here are the basic ingredients for a plain instant oatmeal packet: rolled oats, chia seeds, oat bran, powdered milk, and salt. I also add a bit of cinnamon to mine for it's flavor and health benefits. Nutritional data for the basic oatmeal packets (without fruit or nuts). I included 1-1/2 teaspoons of brown sugar for the sweetener in these calculations. For one plain oatmeal packet: 160 calories, 2.8g fat, 53mg sodium, 28.6g carbs, 3.9g fiber, 7.6g sugars, 6.5g protein. Weight Watchers PointsPlus: 4. Freeze-dried fruit -- I've just recently discovered this healthy alternative to fresh fruit. It is nothing but fruit--no additives at all. It can be eaten as is for a crunchy, healthy snack. It's perfect in these oatmeal packets, because it rehydrates instantly when mixed with water. I prefer this over regular dried fruit, although it is pricier. I've found it at Whole Foods, Trader Joe's, and on Amazon. The volume measures the same as the fresh fruit equivalent. In other words, fruit stays the same size when it is freeze-dried. Dried or dehydrated fruit -- This is the more widely available option. It also works well in these oatmeal packets. However, read the packaging labels; often dried fruits have undesirable additives. When dried, this shrivels and is more dense than fresh fruit, so use less of it than fresh or freeze-dried fruit. Add nuts, if you like. Any favorite nut can be added to these oatmeal packets for a flavor and nutrition boost, although they're completely optional. More dry, flavorful ingredients. Here are some of the additional flavors I added to my oatmeal packets: dehydrated coconut, PB2 (powdered peanut butter), dried orange peel, crystallized ginger, ground vanilla bean powder, unsweetened cocoa, instant espresso powder. 1. Label the top of the bags you'll be using. That way, you can store your oatmeal packets upright in a basket or container and easily flip through them to find the flavor you want. It's much easier to label the bags while they are empty and flat. Ziploc snack size bags work great and are widely available at grocery stores. If you prefer not to use plastic, you can use any airtight container (like jars). Paper bags are not recommended, because they are porous and will result in a drastically reduced shelf life of the ingredients. 2. Add the basic oatmeal mixture ingredients to each bag. Once the oats are added, the bottom of the bags flatten enough for them to stand upright. 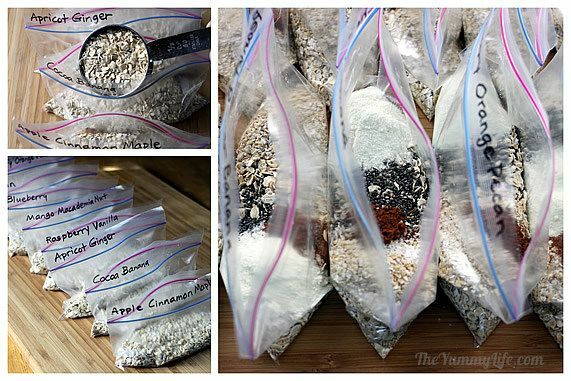 So, you can line your bags up and use an assembly line method for filling them with each ingredient. 3. Add fruit, nuts, and other flavors. 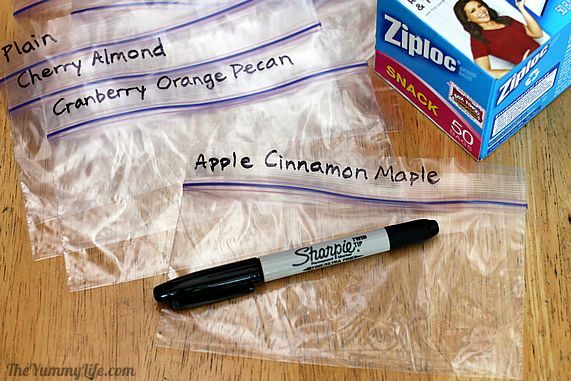 If you've pre-labeled the bags, this step goes much more quickly. Seal the bags tightly to keep any humidity out; this extends their shelf life. As I use my oatmeal packets, I save my labeled bags to reuse and refill. 1. Hot Water Method. (works with quick or instant oats, but not with old fashioned oats). Pour an oatmeal packet into a heat tolerant mug or bowl, pour in 2/3 c. boiling water, stir, and let stand until thickened. Instant oats are ready in 2-3 minutes. Quick oats are ready in 4-5 minutes. 2. Microwave Method. 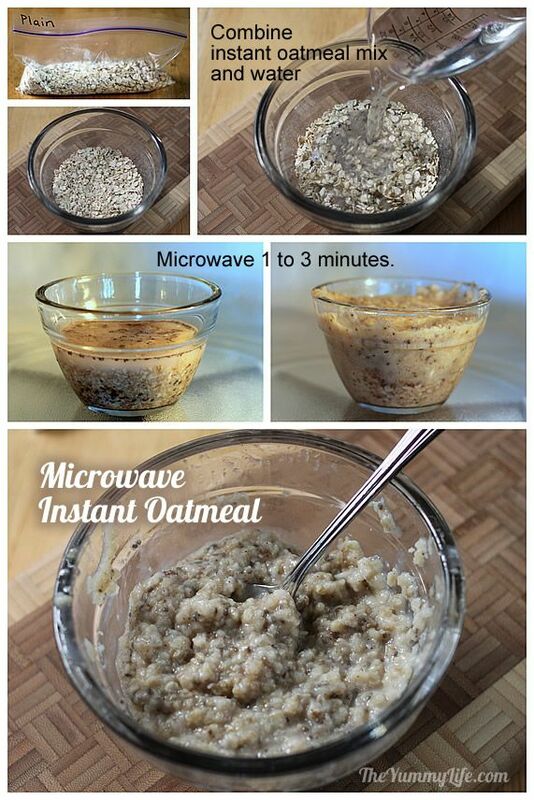 (works with old fashioned, quick, or instant oats) Pour oatmeal packet into a microwave safe bowl/mug that is big enough for oatmeal to double in volume as it cooks. Add 3/4 cup cold water. Microwave on high, 3 min. for old fashioned oats, 2 min. 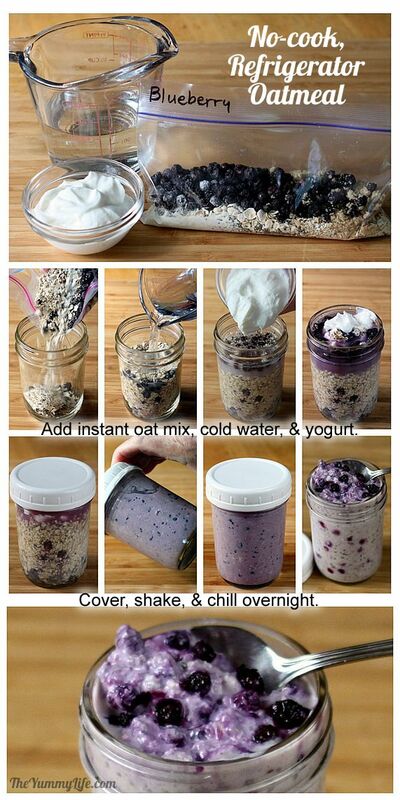 for quick oats, 1 min. for instant oats. (microwave power and times may vary). Works with old fashioned, quick, or instant oats. 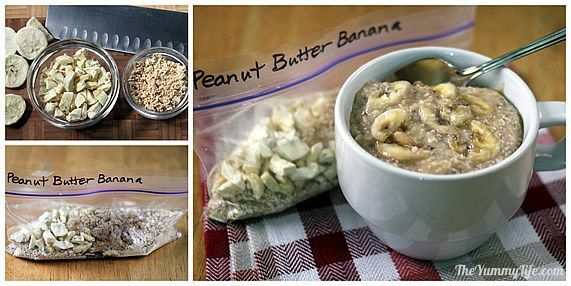 Add an oatmeal packet to a pint or half-pint jar (or other covered container). I use half-pint jars for mine. Pour in 1/2 cup cold water, add 1/4 cup yogurt, cover, and shake vigorously until well mixed. Refrigerate at least 4 hours, overnight, or up to 3 days. They thicken into a creamy mixture that is intended to be eaten cold; however, you can heat them if you prefer. These are some of my favorites, but you can use the same formula to combine your own favorite ingredients. Get creative...the sky's the limit! Refer to the printable recipe at the end of this post for exact ingredient amounts. 2. 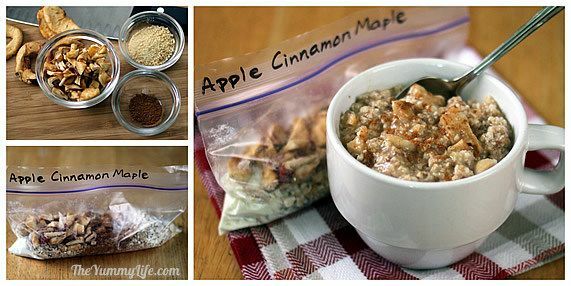 Apple Cinnamon Maple -- To the basic oatmeal mix, I added chopped dried apples, more cinnamon, and used maple sugar as the sweetener. 3. 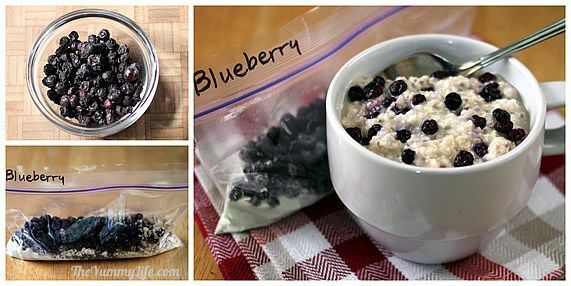 Blueberry -- To the basic oatmeal mix, I added freeze-dried blueberries. 4. 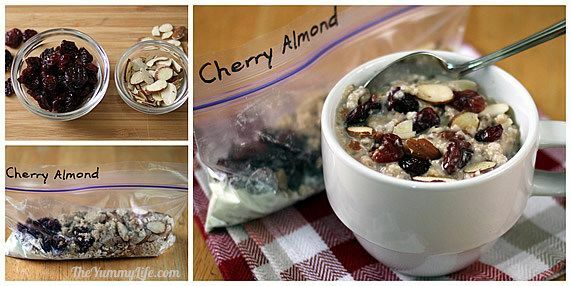 Cherry Almond -- To the basic oatmeal mix, I added dried cherries and sliced almonds. 5. Apricot Ginger -- To the basic oatmeal mix, I added chopped dried apricots and minced crystallized ginger. 6. Cranberry Orange Pecan -- To the basic oatmeal mix, I added dried cranberries, chopped pecans, and dried orange peel. 7. Pineapple Coconut (my favorite...YUM!) -- To the basic oatmeal mix, I added freeze-dried pineapple, and dehydrated unsweetened coconut. 8. 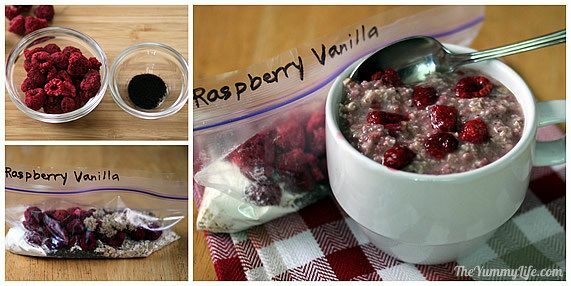 Raspberry Vanilla Bean -- To the basic oatmeal mix, I added freeze-dried raspberries and ground vanilla bean powder. 9. 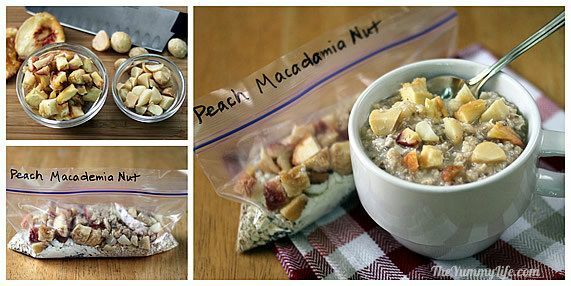 Peach (or Mango) Macadamia Nut -- To the basic oatmeal mix, I added chopped dried white peaches and chopped macadamia nuts. 11. Peanut Butter Banana -- To the basic oatmeal mix, I added chopped freeze-dried bananas (see my note about bananas in #10 above) and PB2 powdered peanut butter. In case you aren't familiar with PB2, it is peanut butter with most of the fat removed, but the protein and nutrition left intact. It's a dry powder that is perfect for adding flavor to these dry oatmeal mixes. 12. Mocha -- To the basic oatmeal mix, I added instant espresso powder and unsweetened cocoa. A busy family in the morning. 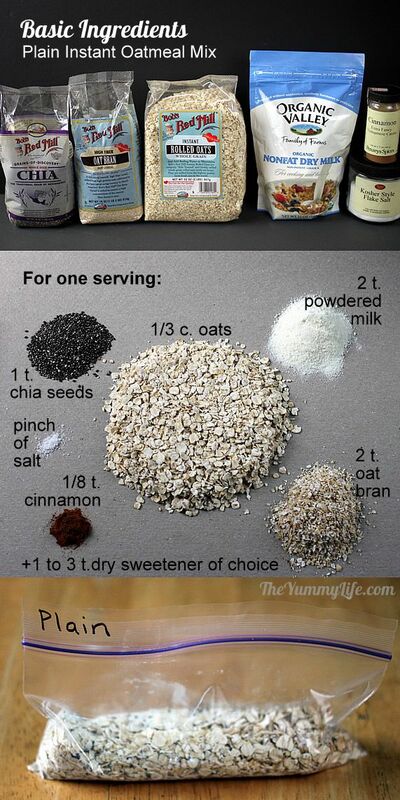 Everyone can choose and make their own oatmeal. A workplace meeting or break room. All you need is hot water (often an option with office coffee/tea makers) or a microwave. A dorm room. 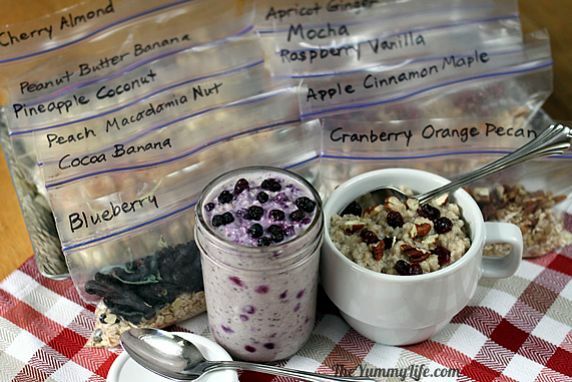 Send a selection of oatmeal packets to a college student for a quick, healthy breakfast before going to class. A brunch buffet table. All you need is a pot of hot water and guests can mix their own oatmeal. A trip. Most hotel rooms have coffee makers that heat water. Camping and backpacking. 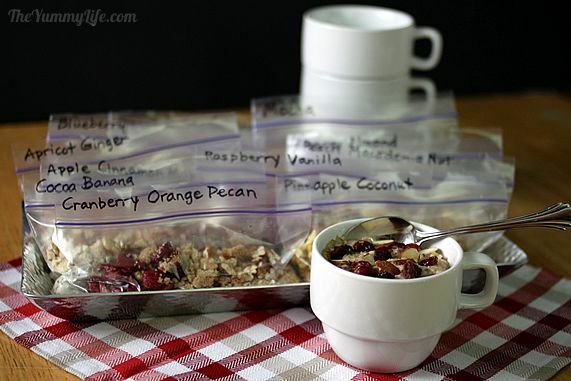 King-Man gave a big thumbs up to these homemade oatmeal packets after his recent backpacking trip. He had these for breakfast every morning. Blueberry was his favorite. This is FAST FOOD that is good for you. I'm loving it. Hope you do, too.